It is no secret that Bloggers are the voices of consumers and blogs, the lifestyle bibles of the new generation. As for Liz of Project Vanity, what turned out to be a simple blog where she chronicles her beauty adventures became a passion project that now inspires and encourages women to be happy with themselves with the help of makeup. For 10 years now, Project Vanity has been one of the go- to beauty blogs in the Philippines and Liz, as one of the go- to beauty bloggers locally as she's gone through tons and tons of products already that she could literally tell you what a bad lipstick formula looks like from afar. Beauty Blogging in this day and age takes a new, exciting evolution: from merely being sent by brands makeups and around the world for beauty- related trips, Beauty Bloggers are actually being tapped now to co- create makeup lines! We've seen Too Faced X Nikkie Tutorials, Becca X Jaclyn Hill, and OFRA X Manny Mua to name a few. In the Philippines, Pink Sugar steps up to the international trend by being the first beauty brand to co-create a makeup line with Beauty Bloggers. 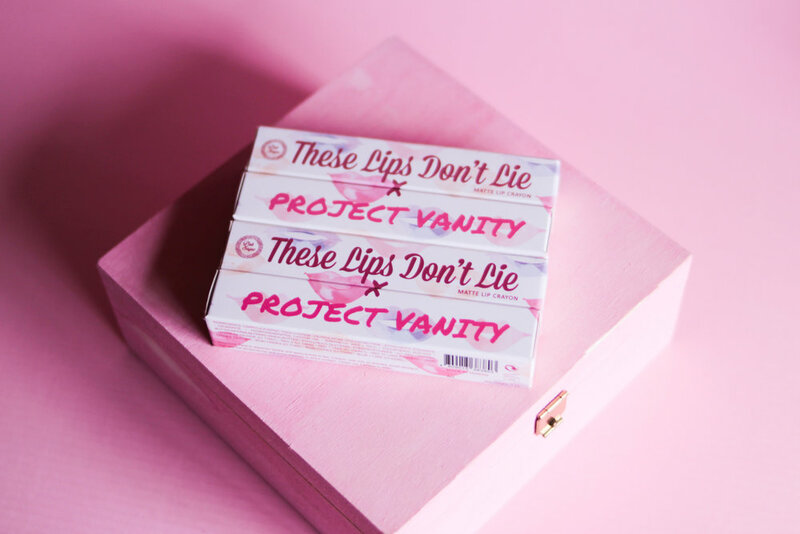 Introducing Pink Sugar X Project Vanity These Lips Don't Lie Lipsticks! These Lips Don't Lie is Pink Sugar's new line of lipsticks and has been launched in collaboration with Project Vanity. Liz, being a lover of lipsticks, created a line that, for her, represents what a good lipstick is all about: moisturizing, pigmented, trendy, and affordable. So what inspired the shades and names of her line? Love At First Swipe, a dirty beige with a taupe undertone, is an ode to Tinder where she met the love of her life, James. Ready in Five is a cool pink that resembles Project Vanity's official hue, Woke Up Like This is a browned Rose that Liz dubs as the MLBB (My Lips But Better) shade among the four hues, and Nothing To Wear is a classic deep berry that she says is a shade that can be your go- to if you have no time to think of picking a shade that will transform your look. Along with These Lips Don't Lie, Pink Sugar launched three new additions to the HD Lipstick Line: From left to right, we have Butter, Sinful, and Wicked. A new product joins Pink Sugar's growing roster: Honey I'm Good Eyebrow Kit. This kit contains three shades of powder and one pigmented wax and comes in two color combinations: Perfect Taupe and Sassy Brown. Brave step, Pink Sugar; it's a first in the Philippines and I could see that it's going to be an exciting project both for Bloggers and their fans! Yay! Super Lovely Colors, Their names are all in fashion! I love seeing local beauty brands collaborate with bloggers and make up artists! Pink Sugar and Happy Skin have been doing stellar jobs as of late, and I couldn't be more proud! I personally prefer lip crayons. Half of the lipsticks I own are in this packaging because they're convenient and pretty cute. When I heard that Project Vanity, a blog I've been following for yeaaars, is collaborating with one of the most promising brands locally to create lipsticks in my favorite form, I panicked!!! The shades are all gorgeous and I love how Ms. Liz and the rest of PV and Pink Sugar were able to bring something of their own into this product, and it's really representative of the best traits of both of them. :) I'm still saving up to get this because I'm definitely getting the whole line! I can really see how much they had Filipinas in mind when they designed these products huhuhu. I can't wait for other brands to follow suit and collaborating with other beauty personalities, and you're the next best contender to collab with in my opinion, Ms. Martha! I can't wait to see how you would bring your passion to life!!! Hope other brands come to their senses and contact you soon HAHAHA! I hope there will be more collabs like this! I'm actually very happy for Project Vanity. It has turned into a great portal for everything beauty! From being a blog to launching their own vanity kits and now a lip crayon line, there is nothing PV won't achieve! I'm excited for the future! Maybe one day, you get to have your own collab with a makeup brand too! I hope more Filipino brands will follow suit and engage more Filipino makeup artists and bloggers! Congrats to Project Vanity for collaborating with Pink Sugar. Ang gaganda ng shades ng lippies. I hope your the next Ms. Martha, kaya mo yan. I love PV to death and I am so happy for Liz! She truly deserves this! pink sugar is doing great! i first saw the swatches from Ms Say's channel.. lahat pretty ang shades! plus very affordable! i cannot wait for another swatchfest on your blog ms m!